Working with refugees has been important to me, not only around my bar mitzvah, but in my life. My mom worked on refugee issues at the State Department for many years, and I learned from her how critical it is that we all do what we can for people who have lost everything and had to leave their homes. I had the chance to visit CRP in Amman with my family in December 2015 and deliver school supplies that my class had collected. It felt amazing to be able to do even that small part to help. As I have studied more this year and learned about what it means to become a bar mitvzah, I understand even more what it means to fulfill the commandments and serve others. Not just once or twice but as much as possible. So I will be donating part of the gifts I receive back to CRP to ensure they can keep doing the work they do to support the lives of so many refugee families in Jordan. 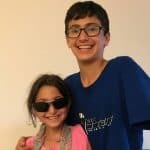 I am also raising money for refugee children who arrive to our area, but I want to do what I can to make sure the refugees who have faced so many tests and challenges are able to have the support they need in Amman to eat, heat their homes, educate their children, and pursue new opportunities in a new country. Please join me and help Collateral Repair Project support those who have lost everything. Even the smallest donation helps! $7 buys a gas canister for a month. $17 can pay for a warm blanket. And $60 helps feed a family of five for a month.